The peaches are pre cooked in a mixture of cinnamon, sugar, nutmeg, and amaretto- because why not eat all your peaches with amaretto!? It’s such a good combo. 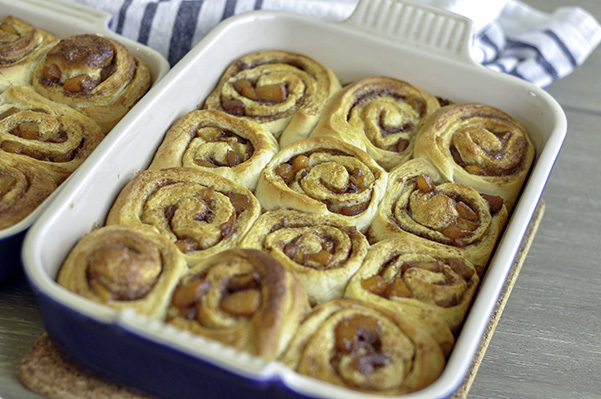 The roll of this cinnamon roll is made from a familiar milk bread recipe that I’ve adapted from '“The Woks of Life” Blog. I’ve used this dough so many times and it’s never failed. It super easy, and yields a pillowy soft, feathery texture that keeps you coming back for more. Everytime I think about using a different recipe for sweet bread, I stop myself with thoughts of this ethereal recipe. The best part is that it’s also really easy to make, which is why I keep coming back to it. With two kids in school I have to time my bread making just right so that it’s all done before that last bell rings! So to have a recipe where I can literally throw all the ingredients into my kitchenmaid mixer and let it rip for 15 minutes on its own is a godsend! However, this dough still is a bread dough, which means it needs to have 2 proofs. Once for an hour and once after it has been shaped for 30-40 minutes. This dough kneads up soft and slightly tacky. You also need no bench flour for rolling it out which is also less mess! Ok lets tally up the pros for this dough : 1. no finicky mixing, 2. no bench flour needed, 3. yields a soft pillow like bread. Yep can’t really beat that! The dough gets rolled out into a large rectangle and spread with softened butter and sprinkled with cinnamon sugar. Then as if thats not enough, I spread a layer of the spiced amaretto cooked peaches, leaving about and inch of space at the top of your rectangle so that the peaches don’t get smooshed out as you roll. 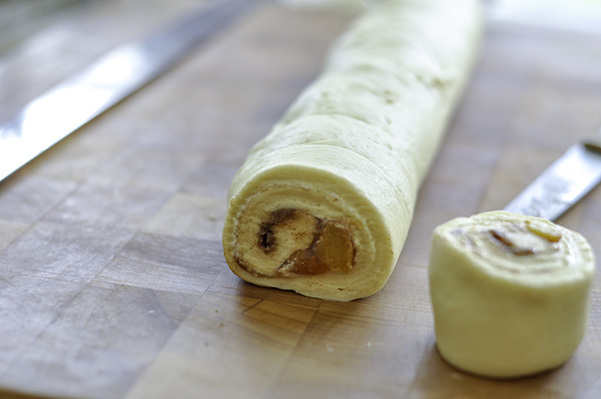 (I speak in very technical baking terms…) Then it’s time to get rollin’. Roll the dough from the long side of the rectangle from the bottom up. This way you can pull down on the roll slightly as you roll in order to get a tighter swirl. Roll it all the way up to the top, then with the seam side down, cut the log into 2 inch rolls. I liked using a serrated knife to keep from smoothing that lovely swirl. Place the rolls cut side up into your baking dish and cover with plastic wrap of a damp towel. Allow this to rise for about 40 minutes. Once puffed up, bake in a 350F oven for 25 minutes or until golden brown. 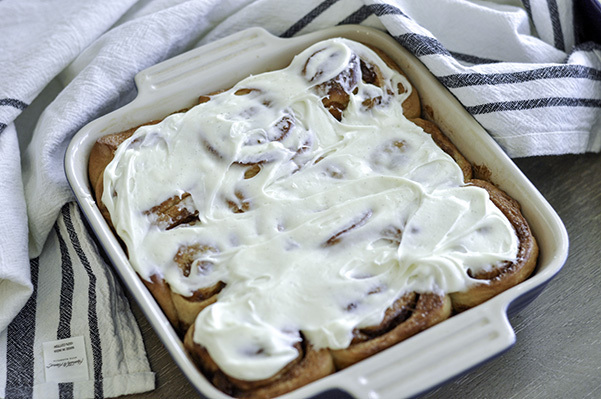 Slather in icing and enjoy warm! 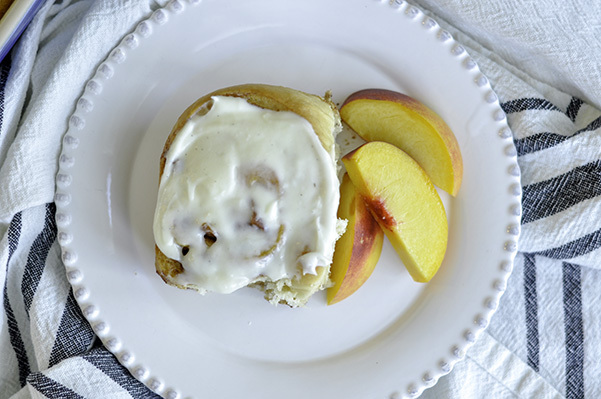 Make the Peach filling by placing all the ingredients in a pot and cooking down until peaches are soft. approx 18-20 minutes. Set aside to cool. Mix cinnamon and sugars together in a small bowl and set aside. Place all the roll ingredients into a large bowl of an electric mixer fitted with a dough hook. Turn the machine on and mix on low for a minute to start to combine the ingredients. Once everything is wet, turn the machine up to medium or if you're using a kitchenmaid mixer, I usually set up up to 4. Allow the mixer to knead the dough for 15 minutes. The dough is ready when you can pinch a piece of it and pull it apart so that it's thin enough to see light through the dough. This is called the window pane. Cover and place the dough in a warm place to proof for an hour. Spread the softened butter all over the rectangle. Them evenly sprinkle on a layer of the prepared cinnamon sugar. Top it off with a layer of the cooked peaches leaving about an inch of space from the top of the dough. Begin to roll from the long side of the rectangle. Roll all the way up leaving the seam side down. Using a serrated knife, cut the rolls into 1-2 inch rolls. Place these rolls cut side up onto a baking dish or cake pan. Cover with plastic wrap and allow to rise for 40 minutes. Bake the risen rolls at 350F for 20-25 minutes. Make the icing my beating the ingredients in an electric mixer until smooth. Ice the warm rolls and enjoy!